Saverio Mercadante composed some sixty operas for Europe’s great opera houses, and was a serious rival to Donizetti, and more briefly, to the short-lived Bellini. Mercadante composed Francesca di Rimini for Madrid, but it was never staged, due to the accidents and misadventures of theatrical life. The opera enjoyed a belated premier performance at the Festival della Valle d’Itria, only one hundred eighty-six years late. Mercadante salvaged some of the music for use two other operas, but these are nearly as obscure as Francesca di Rimini. Francesca di Rimini is a fine example of bel canto opera, a welcome supplement to the fifteen or so works that we constantly re-encounter. It is no insult to say this is no Anna Bolena or I Puritani. Although this opera is not a lost masterpiece which will cause us all to re-evaluate Mercadante’s place in music history, it is tuneful, it tells an engaging melodramatic story, and like all good bel canto works, puts vocal brilliance and endurance on display. Felice Romani, the outstanding librettist of his era, wrote the text. Romani had great successes for Bellini (Il Pirata, I Capuleti e I Montecchi, La Sonnambula, Norma), Rossini (Il Turco in Italia), and Donizetti (Anna Bolena, L'elisir d'amore). The story is simple. Francesca was married to Lanciotto in order to bring peace to Rimini’s feuding families. However, she is the secret lover of his brother, Paolo. All hell breaks loose when the adulterers are discovered, leading to renewed battles between their rival families and the deaths of the doomed lovers. As in so many Verdi operas, Mercadante explores a collision between public obligation (the marriage of warring families) and private desire (the adultery). Romani constructed a plot that addresses themes still current in our times, including marital deceit, sibling rivalry, and honour killing, although the story is rather slow moving, taking three hours and twenty minutes to unfold. Fabio Luisi helps keep things in motion by conducting with crisp energy. The opera is full of familiar musical gestures, but lacks truly memorable big tunes, which is probably why Mercadante is rarely performed today. However, the music is melodic and artfully constructed with a high professional polish, which is perhaps why Mercadante was so popular in his time. An excellent cast brings out the best in Mercadante’s work. Leonor Bonilla as Francesca sings in a bright, clear, and very agile voice. She also dances quite gracefully in Act I. As her husband, Lanciotto, Merto Sungu, is appropriately heroic, anguished, and vengeful. Sungu’s opening aria presents a hero before his fall, and his intelligent ornamentation reassures one that this is not simply generic bel canto. Aya Wakizono sings the trousers role of Paolo, Francesca’s lover. She has a creamy mezzo, and was for me the most exciting member of the cast. Bass Antonio Di Matteo as Francesca’s father, Guido, provides a fine bottom to several ensembles, but has no aria of his own. The three principle singers each have two extended arias. Some of the most enjoyable moments are the ensembles, including an Act I duet for the two brothers. The Act I finale contains a lovely slow passage revealing the tensions arising after the discovery of the secret lovers and the breakdown of Rimini’s negotiated peace. The Act II prison quartet is a musical and dramatic highlight, as the lovers display their vocal prowess while an implacable husband menaces them with poison and dagger. The staging disappoints, with a paucity of sets and props. The prison scene lacks walls, and when Francesca declares “here are my books wet with tears,” there is not a volume in sight. The director realized that if we think of Francesca di Rimini at all, it is in terms of Dante’s portrayal of the lovers in the second circle of Hell, eternally blown about by a whirlwind. The unfortunate result is a production in which it seems a typhoon is just off-shore. The singers wear colorful flowing robes, which the wind machine billows about continuously. This costume disaster makes the singers look fat. I wanted to shut a window to keep out the breeze. More successfully, the ballet episodes are simple and imaginative, representing Lancelot and Guinevere, horses at a tournament, and a group of dancing nuns, among others. Opera lovers understand that production costs must be controlled, so in the end we should ignore the cheesy and unstoppable tempest and be thankful that this rare opera was mounted at all, especially with such a fine cast and conductor. 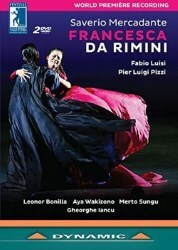 This recording is probably for bel canto enthusiasts only, but if you are a listener who enjoys lesser-known Rossini and Donizetti operas, Mercadante’s Francesca di Rimini will be a treat.